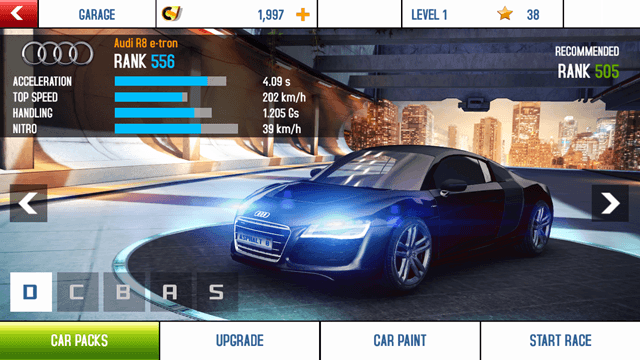 There was a lack of decent Windows 8 car racing games until some time ago, but with the entry of Asphalt 8: Airborne, the scene has completely changed. This game is completely free to download, and works flawlessly on all Windows 8 devices, given that you have a suitable graphics card that can cope up with the gameplay graphics of this game. The game has completely amazing graphics, and you will be blown away by how smooth it plays – but remember that you need to have a decent graphics card of at least 1GB free memory to play it in full graphics quality. The game will still play well even if you don’t have a graphics card, but the graphics won’t be as top notch as you’d expect from seeing the screenshots in this article. Let me give you a bit of warning though – the game’s size is over 1.2 gigabytes, so you might want to give it a pass if you have a metered connection. But if not, you should definitely try it out! Unfortunately, there is no way to change the controls via the game settings as of now. The car automatically accelerates, so you don’t have to worry about that. To turn left/right, use the left and right arrow buttons respectively. Down arrow is the brake button, and space bar fires up the nitrous on your car. If you have an all touch Windows 8 device, imagine your device as the steering wheel, and rotate it right to turn right and left to turn left. Tapping on the right side of the screen will fire up the nitrous, and tapping on the left side of the screen will fire up the brakes. That sums up the controls of this game. The gameplay of Asphalt 8: Airborne is ridiculously smooth. 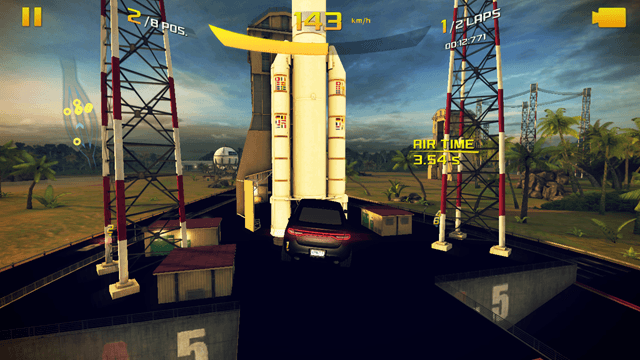 When you launch the game, you will be presented with screen similar to the above screenshot. Click (or tap on a touch device) to continue to the main screen of the app. 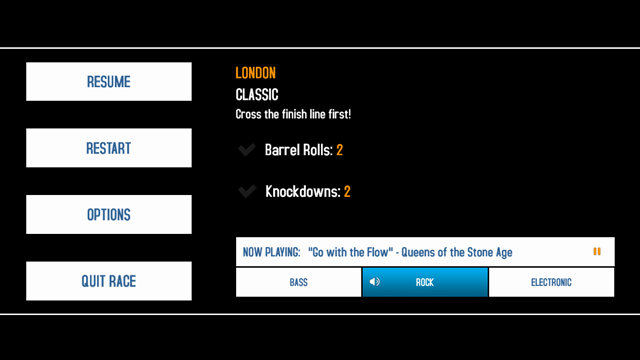 In the main screen of the game, you will be presented with various options (see screenshot below). Your level and stats will appear at the top. You can start a race by clicking on the CAREER button. If you wish to compete online, click on the WORLD SERIES button. There are various seasons of CAREER mode that you unlock as you go. If you look to the right side of the screenshot above, you can see easily that I have already unlocked two seasons, with two CAREER buttons. The season will be listed on the CAREER tile at the bottom. To enter the car shop, click on the 3D rotating car in the above screen, and you can choose to buy any car that you desire, given that you have that many credit points. You can check your credit points at the top of the screen, and can choose to add more by clicking on the + button. Clicking here will allow you to purchase credits using real money (what a shame! ), but that’s the easiest way to progress fast. Let’s say you choose the CAREER mode to start off. Next, you will be presented with levels that you can play. Locked levels have a lock symbol next to them. Levels can be unlocked by earning star ratings in previous levels, or by simply purchasing them through level unlocks (which requires real money, again!). Once you choose a level, you will be asked to select your car. Here, you can see your purchased cars, or choose to purchase a new and better car through your credit points. You can also upgrade your car here, by buying nitrous, brake, acceleration, handling etc. upgrade packs through spending your credits that you earn when you win races. 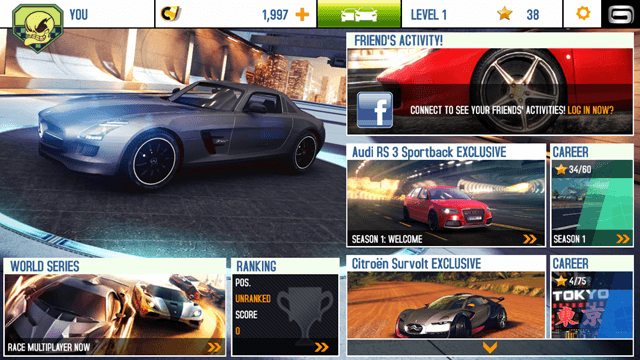 Click on the START RACE button in the above screen to begin your race! Once the race is started, you’ll automatically understand what I meant about the graphics of the game being amazing! In the above screenshot, my car is doing an air stunt by jumping off from an upward inclined ramp! Above, you can see my car running on Nitrous, and about to pick up a Nitrous Pickup (see the yellow bottle). Throughout the game, there are Blue and Yellow nitrous pickups that boost your nitro bar at the top. You also gain nitrous by performing dangerous stunts like air time, barrel rolls, near miss, city havoc, etc. You really need to play this game to understand all these terms! FUN FACT: The game’s races are set in real locations! The maps from real locations have been digitally rendered in the game. Here is what the gameplay screen looks like when you start a game! 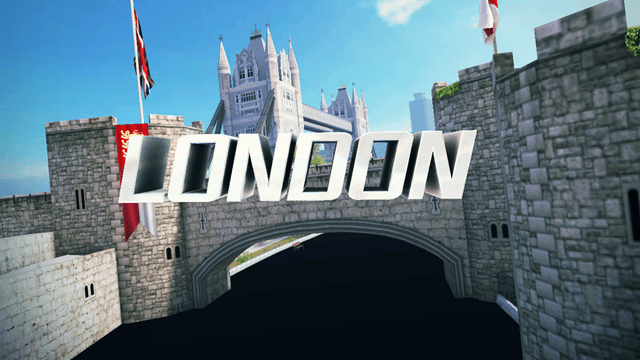 The above race is set in London, as you guessed! The pause menu (which can be accessed by pressing Esc button) allows you to change the gameplay background tracks. The background tracks are real songs performed by real bands, adding to the atmosphere and feel of the game. There are three genres of music available, Bass, Rock, and Electronic. Simply click on their icons and that track will be played! You might also try some other very interesting Windows 8 free games: The Gunstringer and Abyss: The Wraiths Of Eden. My take on the game? 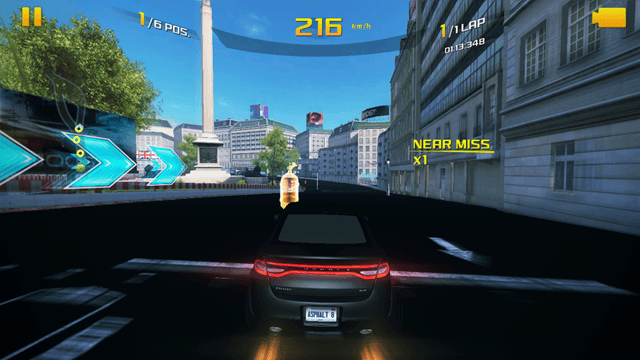 Asphalt 8: Airborne is one hell of a game! With tantalizing surroundings, daring stunts, realistic looking cars that actually exist, gripping music tracks and extreme gameplay, this game gives fruition to the fact that not all good things have a price on them! I do however feel that although the game doesn’t have ads, the game uses an aggressive system of monetizing by prompting you to buy extreme cars with real money when you don’t have sufficient credits. This way of monetization, I feel is much better than ads of course, but the notifications to buy should be reduced. Apart from that, I have no qualms whatsoever with this game! 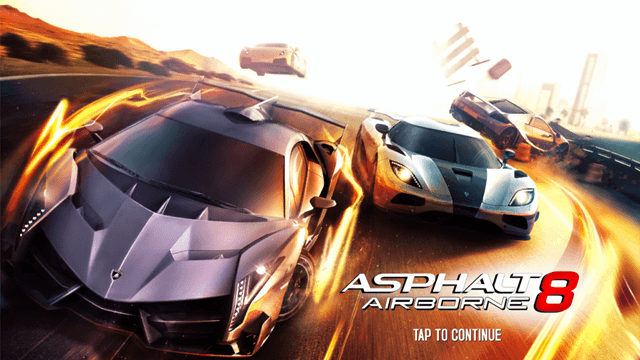 Get Asphalt 8: Airborn here.